Today I'm off to the URJ Biennial, the big gathering of the Reform movement. The last time I attended a Biennial was 2005 in Houston, Texas. In 2005 I was a baby rabbinical student, only a few months into my first year of study. Now I've been a congregational rabbi for six years (and I served for five years before that as a rabbinic student intern alongside Reb Jeff!) I expect the Biennial is going to be a different experience for me this time around. If you want a window into how I experienced the Biennial a dozen years ago, here's the roundup of the 18 posts I made during the 2005 Biennial. The internet was a very different place then. Twitter didn't exist yet. Facebook was a mere eighteen months old. We spoke in terms of the "blogosphere" and the "J-blogosphere" -- terms that make me sound like an internet dinosaur now! I don't know whether I'll blog much from the Biennial, though if something unfolds that feels appropriate to chronicle in this space, I'll do so. The 2005 URJ Biennial was a fascinating, overwhelming, and all-in-all good experience for me. Over the course of five days I attended panels and lectures and workshops; voted on issues of importance to the Reform movement; met a lot of new people; reconnected with a few old friends; had interesting and thought-provoking conversations about liturgy, peoplehood, the rabbinate, and more; worshipped in a few different ways; learned new melodies and savored old ones; bought a bunch of books. Are Dietary Laws Kosher for Reform Jews? How Can Reform Jews Encounter God? (You can also see my handful of Biennial photos here at flickr, if that interests you.) By the end of my Biennial experience I was pretty exhausted, definitely short on sleep, and glad that I chose to attend -- I learned a lot, I met some great people, and now my brain is chock-full of fascinating things to continue thinking about in the weeks and months to come. Thanks for coming along for the ride. If you have thoughts or questions about any of these posts, please don't hesitate to respond, either here or via email! Technorati tags: religion, Judaism, URJBiennial. Rabbi Eric Yoffie's Presidential Sermon -- a kind of State of the Union address, where the "union" in question is the Union of Reform Judaism -- lasted for about an hour and contained several interesting points, and I hope they'll publish it online at some point. He got wild applause when he spoke about the need to care for our gay and lesbian teens, and about the Reform movement's struggle to convince the Israeli Supreme Court to treat an Israeli Reform rabbi (who happens to be female) like they treat her Orthodox (and male) counterparts. After services there were a series of study luncheons; I went to Dream Interpretation from Genesis through the Rabbis, a talk by Rodger Kamenetz (author of eight books, among them my perennial favorite The Jew in the Lotus). I didn't have my computer with me, so I wasn't able to transcribe it, but I jotted a few notes down on paper. It's simplistic, he said, to assert that Judaism is purely a religion of the word; instead, "Judaism is a religion of the struggle between the word and the image, between the interpretation and the dream." Shabbat shalom! Tonight involved two huge Shabbat experiences, one of which I loved and one of which I...didn't, though it was definitely interesting. Services came first, at 6pm. We gathered in an enormous room we hadn't seen before, which felt like a rock concert stadium, complete with big lights overhead and several Jumbotron screens which, when we arrived, were cascading through a slideshow of Reform sanctuaries around the country. (That was pretty neat, actually.) The service was led by four sh'lichei tzibbur, rabbis and cantors together, along with a full band (in an orchestra pit), and the screens switched from camera to camera to give even those of us near the rear a clear view of the faces of the prayer leaders. Rabbi Michael Marmer, from HUC-JIR in Jerusalem, presented a session on Gordon Tucker's new translation of Abraham Joshua Heschel's Heavenly Torah, which presents Heschel's understanding of how the Sages of the Talmud set the agenda for Jewish life (an agenda which has not changed in essence since their day). Heschel lived 1907-1972; born in Poland, and left his Hasidic family (though he never left Orthopraxy) and moved as a teenager to Vilna, where he received a secular education and wrote poetry in Yiddish; then went to Berlin, studied for a doctorate at the University of Berlin, and studied and taught at the Hofschuler for the Wissenchaft des Judentums (the precursor to liberal rabbinic seminaries around the world). He came to North America, spent the years of WWII at HUC; he was uncomfortable both at HUC and, later, at JTS, where he taught from 1945 until his death. He wrote in Yiddish, German, Hebrew, and English. To some extent the difference in language had to do with periods of his life -- e.g. he wrote his dissertation in German because he was in Berlin. But sometimes, after coming to America, he chose to write not in English, and that was deeply significant. In 1962, he wrote a huge, monumental work in Hebrew called Torah Min HaShamayim, v'aspaklaria shel ha-dorot -- Heavenly Torah, As Refracted Through the Generations, in translation. In Friday afternoon's plenary session we voted on several resolutions. None were close enough to require paper votes; they were all voice votes, and all of them passed. The list included resolutions on Global Poverty and the Polticization of Science in the United States (we're against both of those) and Jewish Military Chaplains and Jewish Military Personnel and their Families (we support them). My favorite comment was on the resolution to support Voting Rights in the District of Columbia: "The resolution was endorsed by the Dalai Lama. Can we do less?" That was the whole comment, right there. Ahh, the pleasure of a pithy comment during a long plenary! "As a Vietnam Veteran I find it difficult to speak dispassionately about this resolution...Forty years ago...I asked myself, 'Why in God's name are we here?' I couldn't justify the carnage and death...There are just wars and there are unjust wars. You can hate war, as I do, and yet honor the bravery of those who serve, as I do....This is not a just war." "I am voting for this resolution to support our troops, who put themselves in harm's way and who we as a nation are failing so miserably. Yet I am saddened that this resolution speaks not with moral clarity...but to the war's popularity and lack thereof, and success and lack thereof. I ask, when will we have an opportunity as a Union to speak about the justice of this war? To speak unambiguously about how wrong this war was in the beginning and continues to be?" Since I'm leaving early on Sunday, I won't be present to vote on the resolutions relating to international human rights, torture, and the Confederate flag. It's interesting being a delegate, even though our votes haven't been close and I've been largely aligned with the prevailing mindset; I like feeling a part of the decision-making process, even though I know these resolutions are largely formalities. Right after shacharit (I went to the all-Hebrew one again; not remarkable, but pleasant enough) I followed everyone else into the George Bush Grand Ballroom for the morning's first big talk, by Madeline Albright. Before she came on stage, Helen Waranch, president of Women of Reform Judaism, opened by speaking briefly about the WRJ Biennial that's been happening concurrently with ours in the Hyatt hotel nearby. Anyway. The president of WRJ welcomed us, and Rabbi Jerome Davidson introduced the speaker, and then both of them ceded the stage to the former secretary of state. Anyway, I got to the plenary just in time to see the presentation of Eisendrath "Bearer of Light" Award for Service to the World Community to the Innocence Project, which works to exonerate those who are wrongfully imprisoned; an Eisendrath Award for Service to Reform Judaism was also given to Rabbi Eugene Borowitz, a major Reform teacher and theologian. I'm the 113th person exonerated through our program. I hope for the day when we have a justice system that doesn't make mistakes...For years, I sat on death row, and it was like I was all alone out there. I would pray and pray for the truth to come out. Eventually God did bless me...but I just want to say that the Innocence Project has been working to save lives. Not only does it save lives of people like myself, but it also gives the victims who were victimized justice also. Because if the wrong person's in prison for a crime, then there's no justice... It's really great that we have the Innocence Project. There's a lot of people in prison waiting to be discovered, in this flawed system, and we really appreciate it. Texas state senator Rodney Ellis accepted the award and welcomed us to Houston. "As you know, we're in the heart of the religious right here; we're glad to have visitors from the religious middle and the religious left!" He accepted the award on behalf of his colleagues, staff, and the 163 people who have been exonerated for crimes they did not commit. He said, "I want to stress how important religion has been for all of our clients, and anyone who has been wronged by a criminal justice system. It has been the primary reason they can survive and go on with their lives. This award from you matters; it shows you think our work is important, and that's how we can go on doing what we do. Thank you; this shows that justice really does flow like water, and righteousness like a mighty stream." 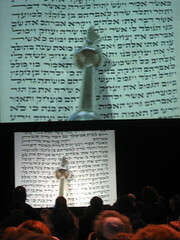 During the first 36 hours of the Biennial, I experienced three very different styles of worship/davvening. Two out of the three prayer experiences made me pretty happy; all three were interesting and instructive. In this post I'll speak briefly about each experience -- one led by two people, and one by twenty; one all in Hebrew, one in Hebrew and English, and one in Hebrew, Spanish, and Ladino -- and will close with some musings on performance and participation, language, and the range of Reform worship. [URJBiennial] How Can Reform Jews Encounter God? This session was led by Rabbi Richard Levy, director of the school of rabbinic studies at HUC-JIR in Los Angeles. He began by talking about the statement of principles passed by the CCAR in 1999, which assert that Reform Jews are engaged in a dialogue with God, with Torah, and with the Jewish people. This is different language from the language of autonomy or informed choice, which was used in 1976. "Of course we are independent individuals, but we are not alone, and the religious decisions that we make are made in conversation with other people, with the Torah as we encounter it weekly and during the seasons, and at all times with God." "If you have any sense at all that there are connections in the world, even on the level of atoms and molecules or people with each other, between you and the mountains and lakes and heavens -- if you believe that there are connections -- I think it's not a big jump to feel that there is a sum of all of those connections, even a Source behind all of those connections. And that's not a bad definition of God. And so the religious life is... trying to experience what those connections are." He asked us to look at the people sitting beside us, and to remember that that person is made b'tzelem Elohim, bears the image of God. What might we learn of God from that person? Even the annoying person tailgating you on the freeway is in the image of God, and if you look in the rearview mirror long enough, you'll meet God there. "The economy...depends on choices that we make. I want to talk about the economy in the context of choice, and in the context of morality. Public discourse these days is controlled by people who have a very constrained vision of morality. They're concerned with the morality of what people do in their bedrooms, but not in our boardrooms! or in the coatrooms of Congress. Public morality is where we need to center the public discourse." "We're living in an economy in which the richest one percent owns as much as the bottom ninety percent put together. We have not seen this degree of inequality of income and wealth and opportunity since the 1920s. By some measures, it was the last decades of the 19th century, the era of the robber barons. I have nothing against people who own so much; but we also have a huge number of people who are poor, or near poverty, or holding on barely to the working class, and are in very grave danger...last year a million more Americans fell into poverty than the year before." I had a delightful lunch with two new friends, a rabbi and a Jewish educator, which I promised not to blog, though we had some excellent conversations. (One metaphor I couldn't resist writing down: that the Reform trend toward reclaiming once-abandoned observances is like the second-wave feminist philosophy which makes it possible to choose lipstick. Expect a post expanding on that notion sometime after the conference.) Meanwhile, here's a partial transcript of the afternoon plenary session, which featured Robert Heller, chairman of the board of trustees of the Union for Reform Judaism, and Rabbi Michael Melchior, an Orthodox rabbi and member of the Israeli Knesset. "It has been said, don't just build a congregation -- build a just congregation!" This panel aimed to help us figure out how to integrate social justice throughout synagogue life. It was led by Rabbi Marla Feldman of New York, NY (the URJ's director of Social Action), Rabbi Steven Chester of Oakland, CA, and Sharon Polansky of Toronto, ON. They began by handing out a veritable library of papers, including two little bound booklets, Speak Truth to Power: A Guide for Congregations Taking Public Policy Positions and K'hilat Tzedek: Creating a Community of Justice. I arrived slightly late to this one, having spent a while standing in line at Starbucks for a truly enormous mocha (a scant five hours of sleep + lots of intellectual stimulation = Rachel In Need Of Coffee) so I walked in as they were beginning a text study session looking at Jeremiah 22:13-16, a passage which begins, "Woe to one who buildings a house by unrighteousness, and chambers by injustice, who uses a neighbor's service without wages..."
[URJBiennial] What Does It Mean to Be Good? The first session I attended this morning was a talk by Rabbi Joseph Telushkin, author of many books (among them The Book of Jewish Values and Jewish Literacy). "More than simply an issue of behavior, for Jews being good is about living a life that reflects the values and ethics of our tradition; about living a life that matters. How do we live such a life?" Rabbi Telushkin spoke beautifully in response to this question, and at the end of the panel Rabbi Jan Katzew gave a brief response. On the first night of the Biennial, I had the profound pleasure of dining at Artista with the San Antonio delegation to the Biennial, at the invitation of Rabbi Barry Block. There are twelve delegates here from Temple Beth El; the dinner also included another former San Antonian, a really nice guy who lives in Atlanta now and with whom I chatted about our shuls, his travels, and GLBT inclusion in the greater Jewish community. Toward the end of dinner, I got to sit a while with Barry and talk about all kinds of fun things -- how Jews respond to Christianity, the meaning of symbols like the cross or the mezuzah (to insiders and outsiders), the trend within the Reform movement toward reclaiming traditional observances, my Aleph studies and how I hope they will progress. It was a highlight of my day. When I got back to the Convention Center, I realized we were in danger of missing Ruth Messinger's speech, which would really have bummed me out. I admire her work with American Jewish World Service tremendously -- she has done amazing things to help heal the world, raising money to do important work around the world, and I particularly admire her persistence in sounding the shofar to awaken the Jewish community about the genocide happening in Darfur, Sudan. Fortunately for me, though we missed the first part of the plenary session (the welcoming speeches, and the presentation of the Eisendrath "Bearer of Light" Award for Service to World Jewry to Ruth), I caught a good part of her speech in response to the award. Unsurprisingly, it was terrific. I offer what I was able to transcribe of her remarks in the section of this post that follows. Once we'd introduced ourselves, Dale asked the first big question: "What is meaningful worship?" 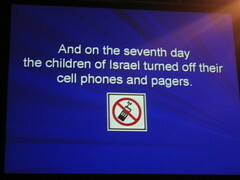 [URJBiennial] Are Dietary Laws Kosher for Reform Jews?